Green HR refers to the contribution of people management policies and activities towards this broader agenda. It’s an important issue for HR because it is clearly an important issue for all employees, as well as customers and other stakeholders. It’s also one in which HR can have a big impact without causing much expenditure – good environmental management can improve sales and reduce costs, providing funding for green benefits to keep staff engaged. Examples of these include IKEA giving all their employees a bike at Christmas (also these are apparently easily available on ebay) and Anglian Water offering employees £1/day if they agree to walk to work. But the most powerful example of green HR came in a presentation of ‘The Bigger Picture’ given by Dev Raval, Group Head of Reward and Strategy at B Sky B. 'The Bigger Picture' refers to Sky's objective to engage its customers in practical and inspiring ways to use energy efficiently. They aim to raise people's awareness of the impact that we as as individuals have just from living our lives. 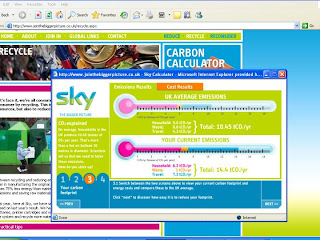 And they do this through tools such as their carbon calculator pictured here. Not an initiative or programme in isolation. Specific actions within the programme have included offering staff incentives for buying a hybrid car, savings on carbon offsetting, on public transport and bikes. Sky have also made additions to their holiday discount scheme to feature holiday companies operating in an environmentally friendly way, and to their volunteering programme, for example to volunteering in schools, to help pupils undertake environmental projects. Some of the company's actions have been really simple, but still very effective (at least for raising awareness), for example allowing employees to buy a coffee mug at their coffee bar rather than using disposable cups, and then receiving 10p off a cup of coffee. Sky have also launched a carbon credit card - employees receive points for taking public transport or walking to work, or video conferencing rather than taking a flight. Prizes are given to people with the most points. Dev also described a personal coral reef available on their intranet - more points means more fish and perhaps a shark, few points means the reef starts to get dirty and all the fish swim away. I thought this was a really imaginative and engaging solution. Overall, I thought this was an excellent case study because of the company’s innovative approaches to benefits, which is an area in which very little has changed recently. But more importantly, I think ‘The Bigger Picture’ illustrates how HR can work with the rest of the organisation to develop a clear and differentiated story of what an organisation is about, in much more than just financial terms, and which can act as a hook to truly engage employees. This story could be green HR, or it could be something else. What I think is important is that x (whatever it is) should be used as an overall anchor for a number of ongoing initiatives, and that these need to be sustained over a relatively lengthy period of time (as is the case at B Sky B). However, green issues are obviously particularly important and you can see my personal commitment to save energy using the button at the bottom of the right hand side of this blog. My wife, Sandra, and I have also offset our remaining CO2 footprint of 14 tonnes per year.